Momos are a typical north eastern delicacy of India also referred to as Dumplings, is made from flour stuffed with sautéed vegetables. It is a delicious combination of garlic, ginger, green chillies and Schezwan sauce in the vegetable mixture. Traditionally, Momos are steamed in bamboo baskets. Nowadays, it can be cooked in a Steamer/Cooker. You can prepare healthy momos by adding various veggies or using bean sprouts as a filling. Opt for colourful, juicy and crisp veggies to achieve the proper appearance, mild crunch, and taste. Momos or dumplings are believed to be of Tibetan origin and is a popular street food in India. Momos are of two types: fried momos and steamed momos. Momos are healthy, particularly if they are not fried. Six pieces of steamed veg momos have 270 Cal whereas six pieces of steamed non-veg momos have 390 Cal. The total calorie count is 45-65 per piece if you don’t go overboard with the quantity. Momos have no specific health benefits. You can cut down calories while relishing momos at a roadside by developing a taste for veg momos, compared to chicken momos which are higher in calories. Always opt for steamed momos instead of the fried momos. You will cut down 20 cals per piece. Avoid chilli sauce as it is high in sodium and has oil as its base. Instead opt for mint/coriander sauce. For homemade momos, use whole wheat flour with maida. You can also add soybean along with chopped vegetables as a filling in veg momos. 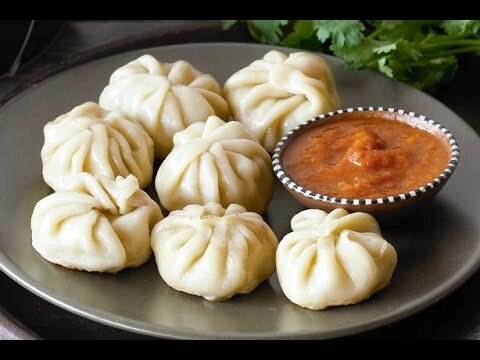 If you are fond of momos, then try homemade momos with different fillings which are healthy and hygienic. Previous articleHow Many Calories Are There in Anda Pav & Does It Have Any Health Benefits? Next articleHow Many Calories Are There in a Frankie & Does It Have Any Health Benefits?